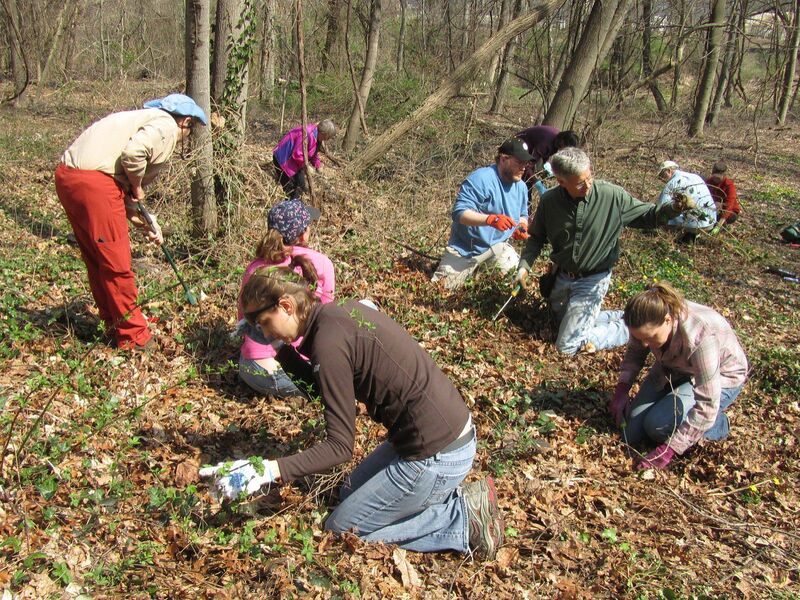 Dedicated volunteers help monthly with Barcroft Park Invasive Pull, an important ARMN Focus Project. Photo by R. Ayres. 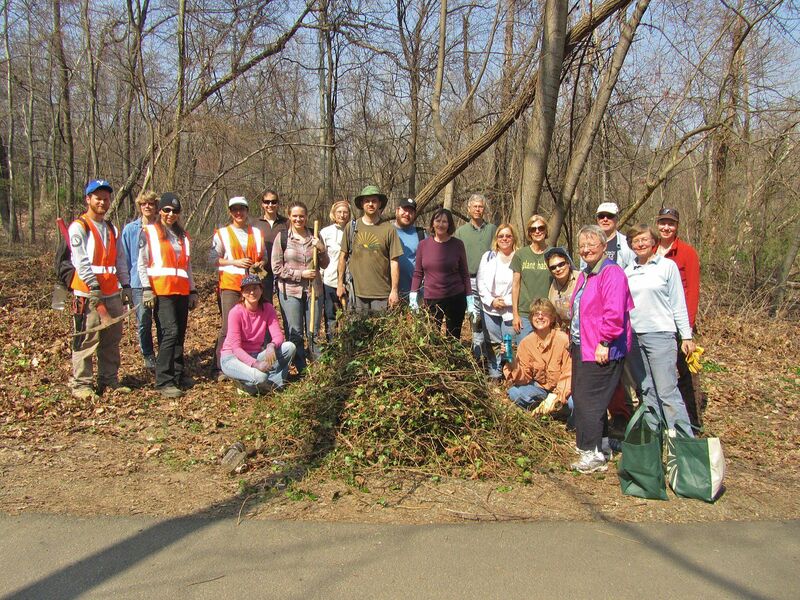 The March invasive pull was the first anniversary of the Arlington Regional Master Naturalist monthly focus work on Barcroft Park. Having bought coffee and doughnuts (hint, hint), I arrived to the area of Barcoft Park we were going to work on an hour before start time to tag Multiflora Rose stems for clipping and digging. But what was this? Blue dye on the Rose? And then in the same area, blue dye on Japanese Honeysuckle? Up to twenty people were about to show up to work on the area. And after that, another twenty members of the current Master Naturalist training class were scheduled to arrive for two more hours of work. What were we to do? This was a good problem to have. The day before, the County had just succeeded in getting a contractor to the park to spray for Lesser Celandine, the beautifully horrific exotic from northern Europe that we Master Naturalists had been preparing the terrain since last October for chemical treatment. Readers of these posts will recall that we have worked an area some 100 yards long by 10 – 20 yards deep between the biketrail and drainage ditch, clearing old growth Rose, Honeysuckle and Porcelainberry in order to allow sprayers access to the Celandine groundcover. By March 17, with summer having preceeded spring, big swaths of the ground in this area were already a shiny green carpet with bright yellow flowers, quite attractive to the unaware eye. The contractor’s focus was the Celandine in and around the Magnolia Bog, radiating out from there, through the planted meadow, and upstream into the area we had prepared. But, highly competent that he is, the contractor also hit our other targets, not only in the area we were working, but across the ditch on the alluvial slope down from Claremont School. As I said, this was good news, but we had to refocus. While botanizing in the park in January, I had discovered a thicket of mostly American Elm, Ulmus americana, Silky Dogwood and Cornus amomum between the shelter and the stream. Cornus amomum was a new plant to me. It grows in such streamside, floodplain habitats, and this 20-yard thicket was becoming the scaffolding for big Porcelainberry vines, which had climbed the tallest Elm saplings and made the leap to the canopy trees bordering the nearby stream. This was worthy work to be done, and 12 of us cut the vines from the shrubs and saplings, and did our best to dig the massive root systems. My guess is that this thicket was planted in a streamside restoration effort some 5 – 7 years ago, but any preparation of the ground left the existing Porcelainberry infrastructure intact. We did not get all of the roots, and the Porcelainberry will need to be monitored for re-growth. Then, having taken a natural history tour of the park led by Greg Zell, the current training class arrived at the shelter to make their contribution to the park’s ecology. Lynda Kersey, Training Coordinator, brilliantly suggested hitting a 40 x 40 patch of primarily English Ivy some 200 yards up the bikepath from the shelter, between the path and the stream. This area had been a jungle of exotic Bush Honeysuckle, White Mulberry, and Porcelainberry among others, but the woody exotics had been felled, stems strewn about, leaving Green Ash, Boxelder, Red Maple, Cottonwood, Black Willow, Tulip Tree and other native lowland species to thrive. An impressive harvest and many smiling faces! Photo by R. Ayres. And, English Ivy had a foothold there. On a beautiful, clear, warm, still-winter day, we spent an enjoyable, social two hours digging it out, generating an impressive harvest. 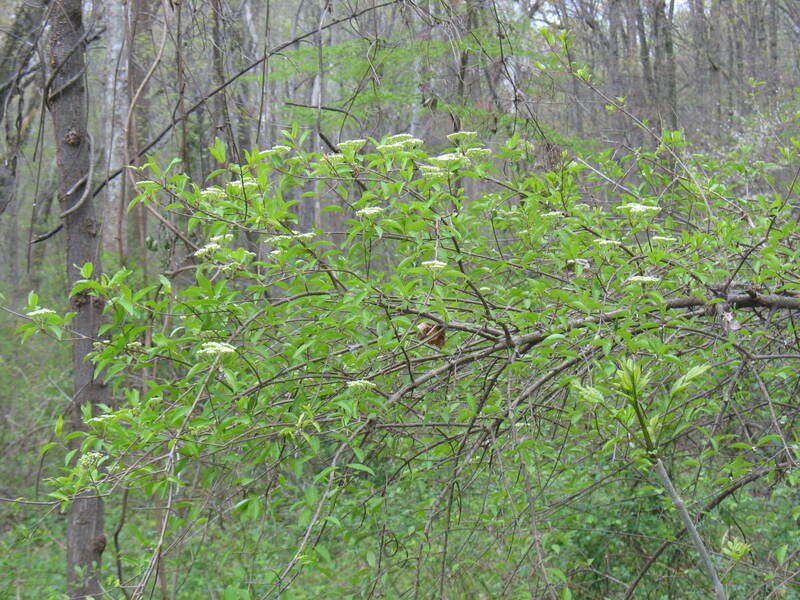 Black Haw Viburnum (Viburnum prunifolium). Photo by J. Hurley. A smaller team cleared a Black Haw Viburnum, Viburnum prunifolium, completely smothered and bent over from Japanese Honeysuckle. Released from its burden, the Viburnum was in full flower ten days later. The work continues on Saturday, April 21. We have urged the County to bring back the contractor ASAP to hit the 18″ bolts of Garlic Mustard and the Lesser Celandine between the bikepath and stream, and remnant Celandine in areas already sprayed. Barcroft Park is in its spring emergent glory right now. There are dozens and dozens of square yards of Mayapple, Spring Beauty, and Trout Lilly, many in the floodplain and many on the alluvial slope. You can find other spring ephemerals too, and the Lowbush Blueberry is in full flower. And just as gratifying is the sight of yellowing, browning carpets of Lesser Celandine in the areas we have worked on. Next year, this area will look like areas we worked on last year, in the vicinity of the Magnolia Bog, both sides of the bikepath, which are now mostly free of Garlic Mustard, Porcelainberry, Lesser Celandine and others. Thanks to all who helped with the Barcroft Park project over this past year. There is more to do, but a visit to the park now will show how much progress we have made. This entry was posted in Barcroft Park and tagged community outreach, invasives, native plants, restoration, stewardship by armneditor. Bookmark the permalink.